Depending on what major religion one belongs to, one believes: That Jesus, unaided, floated up from the Earth's surface, into the sky, and was never seen again, or, that his mother likewise, did the same, or, that Mohammed also floated up, but this time on a horse, or that the prophet Ezekiel, likewise, floated up into the sky, but in a chariot. Do you believe in the Incarnation, reincarnation, hagiography, transubstantiation, transmigration of souls, predestination, eternal damnation? Where are your beliefs when it comes to the worship of a god or many gods, of worship of Ganesh, the elephant-headed god, or Krishna, Vishnu, Satan and Shiva? Don't you believe in holy underwear, magic tablets, holy water that can cure diseases, etc., etc.? Don't you believe that the Bible, Talmud, Book of Mormons, Catholic catechism, and Koran, are all the word of God? Don't you lack belief in Scientology? And, besides these, there are many other dogmas amongst the sects. If you are a believer in some of these beliefs, and reject the rest, aren't you "lacking faith" in those you rejected? Doesn't religious faith require practicing denial of evidence it does not accept? These are important questions. We frequently find social stigma attached to someone who is "lacking in faith,” as if believing in anything, however outrageous, is acceptable if it is sincerely believed in. What's so special about that? For thousands of years, life and death and other major decisions were decided on faith alone: Revelations derived from the reading of entrails, signs in the sky, trial by fire, trial by combat, duels, the outcome of the throw of the dice, etc., etc. All of these outcomes were attributed to the will of a god or gods; all were matters of faith. These were the dogmas. If you didn't accept them, you were "lacking in faith" or "without faith." We may now call them superstitions, but isn't the very definition of faith "superstition?" Consider the "practical" applications of faith. If you pray to Shiva or Ganesh or to a holy cow at a temple, or to Jesus in any church, and Mary at Lourdes, to Allah in a mosque, or to any and all gods everywhere, to be delivered from a disease, for example, will your prayers be answered, or will you say the will of the god/gods, in his/their wisdom, do not will you to be cured? If your small child is sick and you, your family, friends, and church members opt out of medical treatment for the child and pray instead, and the child dies, don't you tell each other that you did not even have faith as small as a grain of sand, otherwise she would have been saved? Could it be that you lacked faith? Or are you making things up to cover all the bases? As one man so aptly said, "Faith means never having to say you're wrong." Is this honest and moral? Yet, faith can be so intoxicating that genocide can be turned into moral virtue, and can propel a huge plane filled with passengers into eternity. Millions have died for and in religious faith. Religious faith makes "some more equal than others," because of their faith, and overrides human rights in a democracy that proclaims equal rights and equal justice for all. 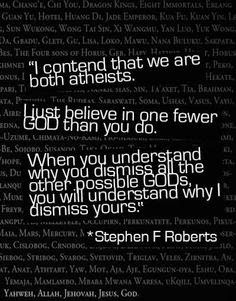 If you cannot or will not believe without evidence, (a.k.a., religious faith), then you are "without faith" completely. If, on the other hand, you do not "have faith,” as meaning "trust," maybe it's because you can't force yourself to trust those who want you to believe without evidence. Is this a "lack," or a positive, mature attitude to maintain? Faith can be so intoxicating that genocide can be turned into moral virtue, and can propel a huge plane filled with passengers into eternity. Millions have died for and in religious faith.So, if you don't believe in everything that millions do: in Apollo, Jesus, Ganesh, Allah, Satan, angels, genies, resurrections, transubstantiation, transmigration of souls, Purgatory, end-times, the angel Maroni, Valhalla, Paradise, etc.,etc., etc...(damn, how they mount up! ), then you're lacking faith in all or some of them - but definitely lacking. So what? You're not alone. Jesus and Paul lacked faith in the gods, while Mohammed, the Arabs, and the Jewish people lack faith or are without faith in believing the creator of the Universe can inhabit the body of a man, and non-Catholics lack the faith to believe that same Jesus who died two thousand years ago, inhabits a wafer of bread. In fact, the first Christians were called atheists because they did not believe in the gods. Why is religious faith, then, really, really, really, important? Does it make humans more moral? You see evidence every day that morality doesn't require religion. ( To quote Bertrand Russell, "I am told religion makes people better. I see no evidence for this.") No; the reason faith is very important is that what you believe determines what happens to you after you die. That's it; that's what drives it. Because of fear or hope in redeeming a religion's promissory note guaranteeing a life forever free of pain, suffering, and with unlimited pleasure - all after death, of course - humans are willing to embrace irrationality/superstition and cling to them. They are willing to lie to themselves to save themselves from a vicious after-death eternity. It all depends, as my friend says, in you making the right guess in choosing one over the others, and in staying "faithful" to it. The bizarre thing is that, after death, the you that is "you" isn't anymore there than it was before you were conceived. But, that's evidence, not faith. Evidence. If you would just believe in all these doctrines, you would not be without or lacking in, faith. You would, in believing, understand, and would be full of faith.